I probably should have shared this a few weeks before Oct 31st. Loads of data could be collected by students: how much candy? how many houses visited? what was the top candy received? What's the ratio of Reese's to KitKat? And probably much, much more. Once this data is collected, students could create and compare some interesting visuals. The visual below takes a slightly different direction and is very clever and, for me, pretty accurate. There is some nice math that could be done with a simple visual like this... for example, have kids write word problems that would go with this one... I bought 8 pounds of candy, I handed out a tenth of it, how many pounds candy did I eat? Now that I think of it, this could be replicated for quite a few holidays & events. 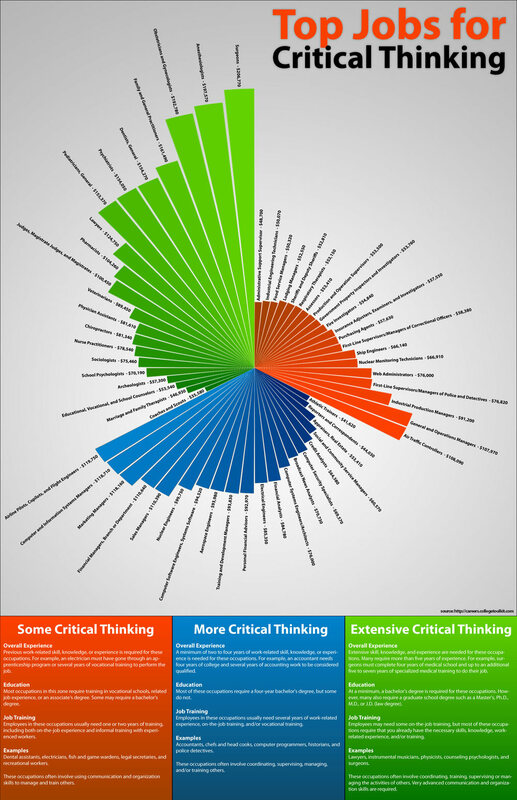 We created this fun critical thinking infographic to illustrate the top jobs requiring critical thinking skills. Students, job seekers, and career changers... you've been warned! Sports junkies love their data. This simple visual is an appealing way to display the tops stats for your favorite players and teams... and where they stand in comparison to their rivals. Go Redskins. Posted in Math and tagged with math, visual, visualization. November 5, 2010 by Brett Sparrgrove. Friday Visualization #7 - How Much is 160 Acres? So, the Homestead Act provided settlers with 160 acres of land provided they met a certain criteria. What does 160 acres look like? This question recently came up at my school and we found the Planimeter to help provide students with a more concrete visualization of the answer. The Planimeter uses Google Maps and allows you to mark off an area anywhere in the world. It will then tell you the acreage for the area you selected. In class we started off with our school football field. This was a great starting point since a football field is such a tangible unit of measurement familiar to students (plus, we could see it out of the window of the classroom). 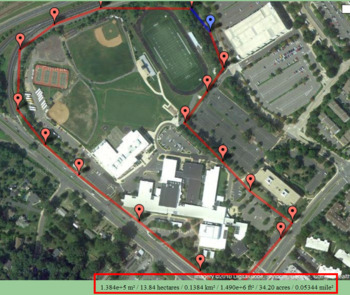 Planimeter determined that our football field was approximately 1.3 acres in area. Wow! the homesteaders received 160 acres... so we now had a math happening... how many football fields in 160 acres? We then tried out our school's campus... only 34 acres. Another math happening... how many of our campuses would fit onto a homesteader grant? Still not 160 acres. We needed something larger... how about the nearby (and world famous) Tyson's Corner Mall and all of its voluminous parking? Hey, 160 acres... look at that. That's a lot of land. We looked around at a few other Washington, DC landmarks also. 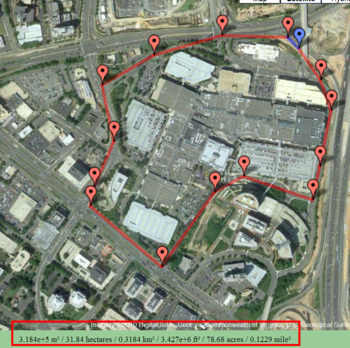 We found that FedEx Field, the home of the Washington Redskins, and all of its parking, is also right around 160 acres. It's visual - I could tell students that 160 acres is about the size of Tyson's Corner, but so much better for them to see it. Its localized - We used references that were familiar to students. Most of them had been to Tyson's Corner and knew that it was big. Naturally, using our own school playing fields and campus was also great. Students were encouraged to draw 160 acres around their own houses to see what that looks like. Students can be involved - with laptops, students can be involved in following along and then trying out their own measurements. Send students out on an acreage scavenger hunt. Math - Loads of math here, conversions from acres to square feet, square meters, perimeter, what percentage larger is FexEx field than our school campus, scientific notation, etc. Technology Education - Evolution of farming equipment as farmers wanted to have larger and larger farms. 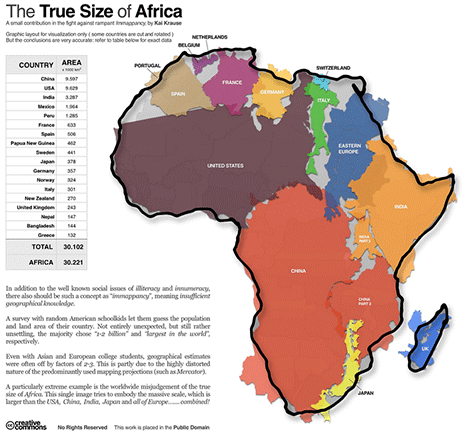 Social Studies - Map skills and Geography are a no brainer. Of course, there is more you could do with this, I'm sure. Give Planimeter a try and remember to share your ideas. Posted in Math and tagged with math, social studies, visual, visualization. October 22, 2010 by Brett Sparrgrove. This got my brain working... what other ways could we keep track of something and create a similar visual? I thought it might be interesting if student kept track of their daily activities (not all of them, just a few of the "major" tasks). 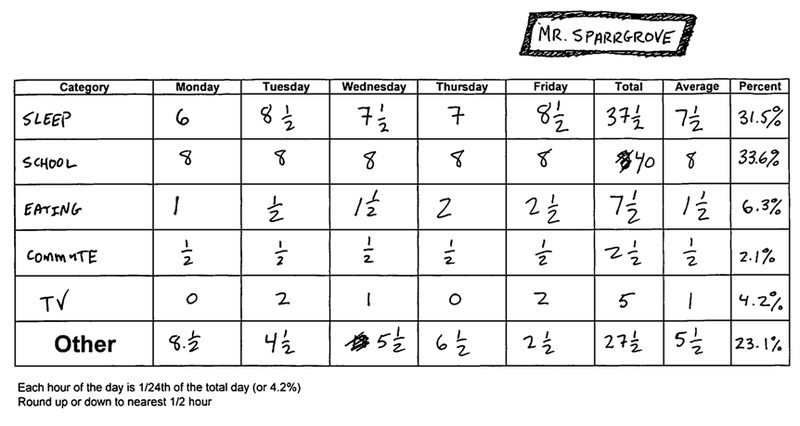 I created a "Time Sheet" that kids could use, my sample is here and the template here. Lots of great math involved in keeping this chart. Once I had all of the data I needed I created the visual below. I used PowerPoint to create it since I wanted some "creative" license to make it the way I wanted but you could use any graphing program. This was a fun activity for me to do and I think it would be fun for students as well. You could have kids keep track of all sorts of stuff throughout the year (# of pages they read, minutes spent at recess, video game time, # of google searches, Big Macs consumed, etc.) 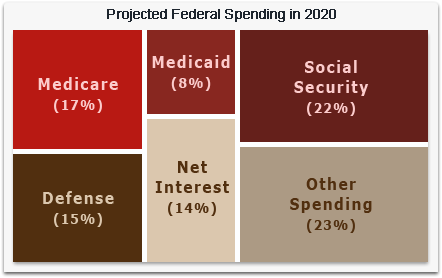 ... once they have tons of data they could create all sorts of personally relevant visuals. The math involved can be as simple or complicated as you would like. I think it is important that we keep an eye out for these types of connections... they appear every day. Making math relevant and interesting for students is important. Posted in Math, creative, visualization. May 7, 2010 by Brett Sparrgrove. I saw this picture today and thought that a math teacher* could have a lot of fun with it (maybe a bell work activity?) Just pop it up on the projector and see what students can do with it. Proportions, percentages, ratios and more... please share your thinking! 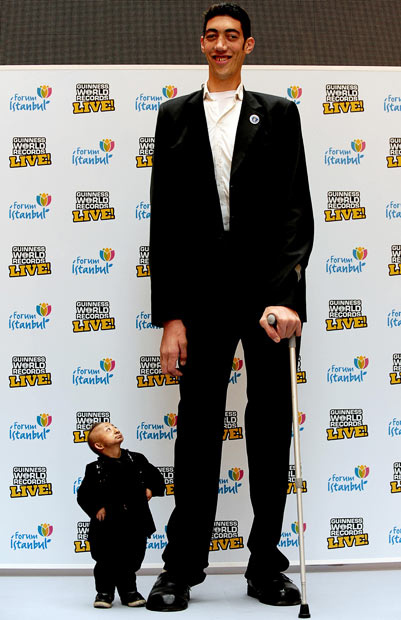 * science teachers could probably do something with it as well... or you could have your students see what information they could find out about the two people in this photo... a good test of their Google skills. You can even teach graphing (albeit very creatively) through popular songs, poems, stories, pretty much anything where numbers and choices are involved. ... thanks, Paul Simon & Art Garfunkel. 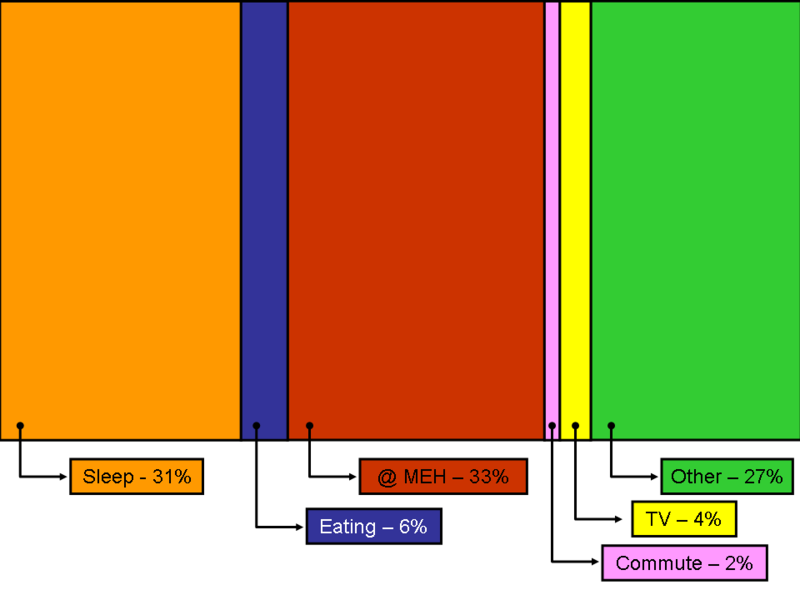 You can see more of these creative graphs here on flickr. I guess my point here is that once you start thinking about the creative ways you can get your graphing objective met, you should really GO FOR IT! November 17, 2008 by Brett Sparrgrove. There are some excellent math websites out there. I wanted to stay away from the "drill and kill" game sites (you can find those on your own) and look for sites that promoted critical thinking and problem solving skills. Enjoy. All of these sites will open in a new window. Virtual Manipulatives - Man, this is the place to start. Excellent and fun to boot. GeoGebra - Ok, this is really cool. There is a slight learning curve for it. I'm only beginning to get good with it. Click WebStart when the page loads and go for it. Logic & Reasoning - Help students sharpen critical thinking skills. More Logic Games* - Man, Rush Hour is hard!!! * Bess may filter these... but they should work from home.